Is there a better alternative to Dialog Maker? Is Dialog Maker really the best app in AppleScript category? Will Dialog Maker work good on macOS 10.13.4? 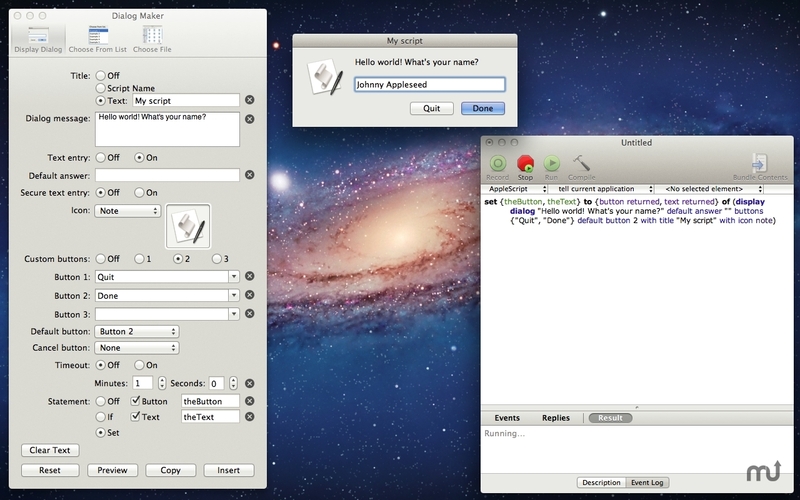 Dialog Maker is a utility for AppleScript user-interaction commands which does all the tedious typing for you. It handles 'StandardAdditions' user-interaction commands such as display dialog, choose from list, and choose file with many more to come in free updates! Dialog Maker knows all existing parameters for each of these and allows you to create sophisticated prompts very quickly with the bare minimum of typing, consistently halving the time for creating such commands. Dialog Maker takes your command's options and turns them into a piece of script, you can then copy it or even preview it before use. Bug fixes for High Sierra. Dialog Maker needs a review. Be the first to review this app and get the discussion started! Dialog Maker needs a rating. Be the first to rate this app and get the discussion started! It has received positive reviews from beta testers who confirm how useful, workflow-oriented, quick, and easy it is to use with a detailed and useful help (which resides on your Mac and doesn't annoyingly take you to some website). Thank you for reading, or even purchasing! If you have any questions please contact dev.richard@me.com.